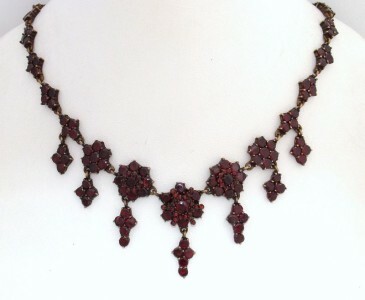 This is such an Exquisite Antique Bohemian Garnet Festoon Necklace. No amount of pictures can truly display the magnificent sparkling deep red of these genuine stones – in person they are just amazing! 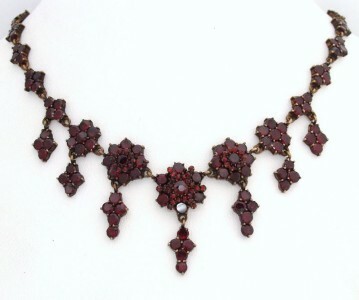 Garnet jewellery was at its height of popularity during the 19th century; and it was during the Victorian era that Bohemian garnet jewelry developed its characteristic design of the garnets entirely dominating the metal setting. This type of jewellery utilised rich claret-hued stones (pyrope garnets) that had been mined in the Bohemian region of Eastern Europe. Highly prized for both colour and light refraction, these close-set faceted garnets take on a striking luminosity and intense color when placed in clusters. It is said that the fire from a single Bohemian garnet can warm the coldest heart. During the Victorian era, Western cultures believed that garnets would enrich the blood and provide the wearer with a long, healthy life. Victorians believed it empowered them with truth, constancy and faith. Garnets are also the birthstone for January and this bracelet would sure make a wonderful gift. I have the “Garnet Jewellery Bug” and when you see these garnets in person, you’ll understand why. I’ll describe the necklace however no words or pictures can accurately present the beauty of these gorgeous old pieces; they are best viewed in person. It is a HAND MADE necklace comprised of two different shaped garnets – Rose and a flatter cut type. The front features 5 rosettes of 2 different sizes in a snowflake arrangement – 3 are layered. Seven “dangles” hanging in diamond shapes and the remainder of the chain is fashioned from diamond shaped arrangements of four stones with the amazing Original rosette box and tongue clasp in perfect working order. Please view the pictures for the best description of the design bearing in mind they do not do it any justice. It is set in what is termed Garnet Gold, an alloy metal with a gilt finish which, when highly polished can take on a golden appearance. Left unpolished – and as displayed in the pictures – it has an aged, silver/gold toned patina. It has been thoroughly cleaned however it had not been polished. It is a personal preference. There are no identifying markings but the design, clasp and construction assist in dating this to the late 1800s. Near MINT ORIGINAL Antique condition! All the stones appear to be original with no replacements or repairs and firmly in place with no chips or cracks visible. There is no damage or misshaping. I have pictured it in different light to show the garnets’ gorgeous red wine colour. You will be Absolutely thrilled – I guarantee it! A Wonderful Old necklace in Original condition not to be missed! A very Old Period piece to be treasured.